Home English Under the ice of Greenland found a huge crater: how many? 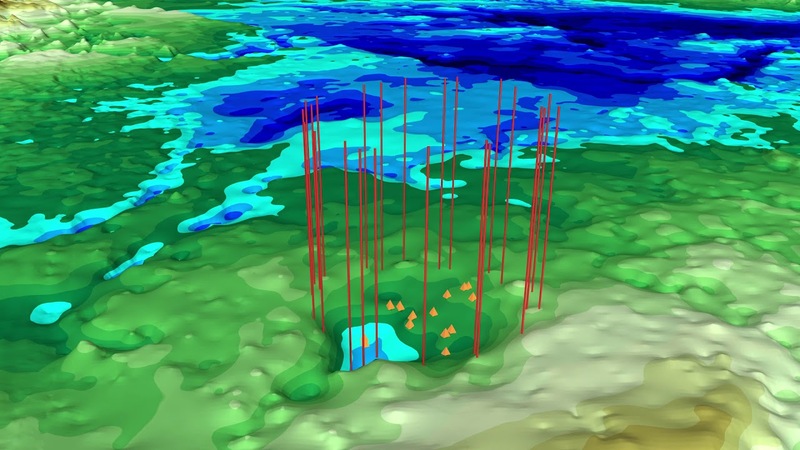 In November 2018 under the Greenland glacier Hiawatha found a huge crater with a diameter of about 31 kilometers. Geologists were very surprised to find, as they already tend to think that thick layer of ice fully aligns like depression. They decided not to stop there and continued the search for other ice craters. The result was not long in coming — it turned out that not far away there is another, larger crater with a diameter of 36.5 kilometers. It is believed that both the crater was formed by falling meteorites. On the surface of the Earth is about 200 impact craters, and a couple of harp is the only thing under a thick crust of ice. They were discovered by a group of NASA researchers, under the leadership of Joseph McGregor. For their research they used data from IceBridge aircraft that have previously helped find a dangerous cavity under the glacier, Thwaites. Initially the researchers assumed that the craters were formed from the same meteorite impact. Perhaps, once upon a time fell to Earth double asteroid system, and maybe one asteroid simply disintegrated into two parts during reentry. However, geologists quickly abandoned this theory: the brink of new and old crater are very different, i.e. they could not be formed at the same time. The age of the crater Hiawatha is estimated at 100 000 years, and the second crater was probably formed in more ancient times. This is evidenced by strong erosion, possibly, initially the crater was ten times deeper and its depth was more than 800 meters. The researchers intend to study carefully the samples of rocks, as they still have doubts about its origin. The new crater while there is no official name, but the authors want to give him the name in honor of the late scientist Stan Patterson, who restored the climatic data for the last 100,000 years by studying ice cores of Greenland. Researchers are surprised and excited at the seemingly studied along and across the Earth can you find such huge craters. What do you think, what other such secrets is fraught with Land? Their fantastic assumptions feel free to write in comments and discuss the news more in our Telegram chat!